Max vows to throw away of all his picture books, because they do nothing but cause him trouble. He read Harold and the Purple Crayon, but when he drew on the walls like Harold, his mother sent him to his room. When he wished a boat would take him away to Where the Wild Things Are, nothing happened. He woke up in his same old room with his same old picture books – the ones he now hates. Readers will relish being in on the joke as Max complains that picture books make no sense (“Cows can’t type… and caterpillars don’t eat salami or Swiss cheese…”). And they will laugh out loud at a hilarious bit about what happens when you take Dr. Seuss’ Green Eggs and Ham too seriously. As Max rants on and on, he realizes that he hates his picture books because sometimes they cause him to have strong emotions, like the time Are You My Mother? made him cry. Remembering that moment triggers something inside him to run to the trash and dig out the discarded book, and before you know it, he is lying on his floor with all his picture books around him, reading them again and again and again. 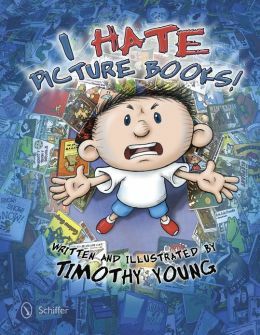 Perfect for second graders who may be advancing to early readers, Young reinforces how picture books stimulate our imaginations and stay with us long after we graduate from them. His skillful recreations of classic illustrations will have readers chanting, “I’ve read that one!” and will whet the appetite for those who haven’t. Reading activities could easily stem from the hundreds of familiar book covers that appear within the pages. Title: I Hate Picture Books!